For our final Parent Tech Coffee Morning of the year we had a great conversation about Minecraft. It was a very popular topic, with over 30 parents joining us this morning! This was a great conversation starter for all of the things that students can actually do on Minecraft. It’s not just for building (especially with the addition of different mods)! The video also prompted lots of great questions, so we had a group of grade 6 students join us to share how they use Minecraft. Minecraft is a great tool for learning! They learn how to collaborate, cooperate, and create in a digital environment. They have to explain themselves clearly (either in person or via the chat in Minecraft) so they can collaborate and get things done. They use Minecraft for all sorts of things including: creating a dwelling in a specific type of biome (like an igloo), creating buildings from different time periods that they are learning about (like the Renaissance), creating regions that they study (like the Silk Road). Mostly students are using Minecraft in Humanities here at YIS, but it can be used for other subjects. There are many different mods that can be added to a Minecraft server and students like to explore new ways to interact with the Minecraft world. Mostly they play a pretty friendly and non-violent game, and mostly they play with people they already know from school. They are really happy to have access to Minecraft for learning. Students can also choose to play outside of school time on other servers (not managed by YIS). Tell/Show me about what you’re doing in Minecraft. What are you learning about when you do that? Are you playing on a server? Are you talking to other people as you play? Sometimes children end up creating bad habits in online spaces – like being violent in Minecraft, sharing personal information with others, or chatting with strangers in spaces, so it’s very important to help them build a strong understanding of what is safe and what’s not. This is a great opportunity for conversations – the same way we talk to students about how they interact with strangers in real life can be applied in a digital environment. A very important takeaway from this session is that as parents, you already have all the skills you need to help your children learn how to make good choices in online spaces, it’s just a matter of transferring those skills to a digital environment. Often children will say to their parents “you’re the only one that makes me….” but trust us, you’re not! It’s ok to be a parent in online spaces the same way you would in physical spaces. We hope you enjoyed today’s session and look forward to seeing you again next year! Have a great summer! What’s so powerful about mobile devices (including iPads)? Why do we have them at YIS? How do they reflect society’s use of technology? After watching the video we talked about the difference between a laptop and a mobile device, and the kinds of things we can do now that technology is becoming more and more mobile. Being able to use devices in different places with ease – students feel more comfortable using their iPad on a train, rather than a laptop, for example. Different devices work well for different types of things. Laptops are great for lots of writing and heavy work that requires multiple apps or tabs open. iPads are great for interactive things, creative things, or even just reading. The form really matches the function. Being able to use different kinds of devices helps us be more creative. There are many different ways to do things that we can now explore. More access to more devices often means more time on devices. We have to manage this in the same way that we manage other “traditional” behaviors that we might want to change. If students spending too much time online, that means they may need a little bit of help making better choices. Lots of strategies can be found here. As a society we’re not quite sure where and how mobile devices will take us. Technology is constantly changing and we are still learning how to deal with them. Although some of these ideas seem far off and challenging, it’s good to think about what might be on the horizon! Thanks to those parents who joined us this morning! Looking forward to our next session! Note: this session runs several times a year at YIS. We can all relate to the struggle to balance our many devices, from mobiles, to laptops, to kindles, to iPods, and everything that comes next, so this time for focused conversation was perfect. Along with our wonderful parent community, Mr. Clark, Ms. Cofino and Mr. Hamda were there to help share ideas and practices that have worked (as well as those that haven’t). We had a very productive session, and developed tons of great ideas to help our children build and maintain a healthy and well-balanced lifestyle. 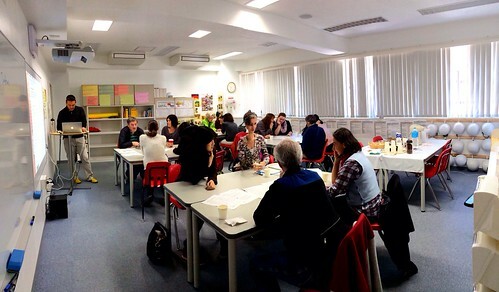 This session was also run last school year, at the request of parents. We’ll host it again later in the year! Although many of the tools we use to connect and communicate have changed, what we’re doing with them is very similar to more “old school” methods – like passing notes in class, or reading under the covers at night, or talking on the phone. For some reason, it seems that when children (or adults) are using technology tools, we are reluctant to interrupt them. We have developed a kind of societal norm that “laptop space” must be private space. Adam shared a story about being hesitant to ask his son, in fourth grade, to show him what he was doing on the laptop, simply because it was a laptop – even though he’s the parent, he bought the computer, and it was actually his wife’s laptop. Even though we already have great strategies, as parents (and teachers), to help children manage their time and responsibilities well, sometimes it’s challenging to remember to apply those strategies in this new context, because of the perceived privacy norms. Technology as more visible: In the “old school” context, when children spent time hanging out at places like Gigi’s, their parents might not know really what was happening, and any mistakes made could be forgotten with time. It was almost like those mistakes and behavior were invisible. In contrast, today’s “hang out” space is often online, where every action is visible and permanent. Technology as less visible: In the “old school” context, when children hang out and chat at home, their friends are there, so parents can see and hear what they’re doing. However, with technology, children can be “hanging out” in a common space in the house, but parents can’t actually see or hear anything, since it’s all on the computer. In this sense, the technology almost makes the behavior “invisible”. It’s important to remember that all of the adults in our children’s lives are role models. The behavior they see being modeled as adults is behavior they are implicitly being told is appropriate. At Parent Teacher Student Conferences yesterday, there were long rows of students on their mobile phones, sitting next to their parents, typing away on their mobile phones. Although it sounds too simple, we see in the classroom that by clearly stating specific expectations and setting clear boundaries, students are much more likely to follow those directions. In contrast, if we allow expectations to be more implicit, it’s so much easier for students to ignore those unstated “understandings”. In the end, we’re working towards each student developing their own self control, and an appropriate level of balance that works for them and their family. To do so, we would like to work as a team: parents, school and students. To help clearly define the expectations for balance (and to set clear boundaries), no laptops are allowed at break, and laptop use is only allowed in the CLC workroom during lunch (otherwise students are not allowed to use their laptops during lunch. To get started well, we had two full days of orientation at the beginning of the school year where we discussed the Responsible Use Policy, Digital Citizenship and Balance at length in a variety of contexts, as an introduction to our CLC. We also had a mandatory parent information session for middle school parents and all middle and high school students (voluntary for high school parents). We have an overarching Digital Citizenship curriculum, called Digital Dragons, which is currently being taught through Humanities in middle school. 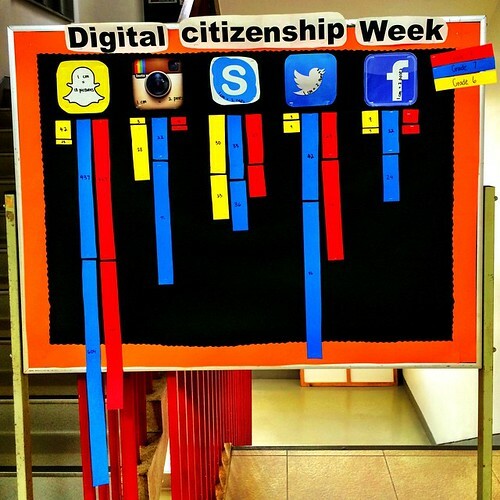 After Spring Break, we’ll have a Digital Citizenship Week, when we revisit the major themes of the Responsible Use Policy through a variety of activities and discussions. Our Student Tech Team regularly produces short video tutorials, to highlight important aspects of effectively using the laptops. Recently, they highlighted a number of productivity apps like “Self Control” which was one of the ways that students could help manage distractions. We’re implementing homework calendars in all middle school tutor groups, where all major assessments will be added as events in a shared calendar for each tutor group. Parents and students can then subscribe to these calendars to have the reminders pop up on their mobile devices. We’re developing a digital student planner to help students manage their assignments in an efficient way. All of these topics are important points of discussion within our Tutor program at all grade levels. Set time limit per day for total screen time, and gradually allow the child more control over how they allocate that time. Set a specific time, or set of times, when the computer can be used. No computer use after a certain time. Use a kitchen timer to help students understand how long they’ve been online. Set a reasonable amount of time, and put the computer away afterwards. It only takes a few times with this technique before the amount of time becomes routine. Take Advantage of Tech Breaks: Research shows that knowing you have specific time set aside to check social networking sites actually helps students focus better, so Dr. Larry Rosen recommends 25 minutes of homework time, then 5 minutes of a tech break, then study again. Could Checking Facebook in Class Help Students Focus? Regular and open conversations with your child are always the best way to make these strategies successful. Thanks to all the parents that attended today’s session! See you next time! Creativity takes effort: We often feel like you are either creative or you’re not. This video highlighted for us the importance of effort, motivation and perseverance in our creative endeavors. The process of being creative is something we can learn and practice, and continually work towards improving. 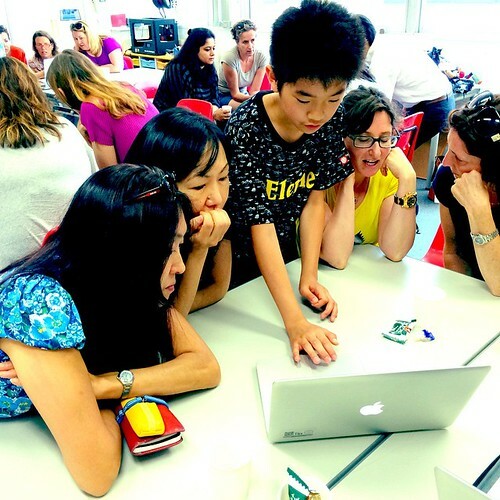 Opportunities for creativity at home and in the classroom: We talked about the type of learning that happens here at YIS and the way that we prioritize creative demonstration of learning (rather than regurgitation). The IB programs (PYP and MYP in particular) emphasize student inquiry and allow for many forms of differentiation, which helps encourage students to share their learning in different ways. As teachers, we also have the opportunity to be creative in our instruction and learning environments here at school. We also talked about student creativity needing adult support – for example, children may say “I’m bored” when they don’t have a defined activity. Rather than solve the “boredom problem” with a movie, a video game, or another device, we may want to encourage exploration and creative thinking with other options. We noted that for the first few times, children may need guidance and support for how to do this – putting out materials to explore with, for example. Growth mindsets: The idea of continuing to improve our creative ability sparked a conversation about how our own perception of what we can and can’t do can limit us, unintentionally. A number of teachers read the book, Mindset, by Carol Dweck earlier this year, which emphasizes the importance of developing a growth mindset – basically the belief that you can learn new skills and improve in areas where you are weak (in any area of your choosing). One of the key points in the book is that the language that we use with children is very important in developing a growth mindset. Rather than saying “you’re great at that” or “you have a natural talent for that” we may want to use language like “I can see you’ve put a lot of effort into that” or “you’re working really hard in that area and it’s paying off”. The idea that we can work towards improvement in areas where we are strong as well as weak is part of the growth mindset. The “Taste Gap”: One of the challenges of being creative is that we can often recognize high quality work that we like (this is our taste level), but when we try to produce work like that, we don’t have the skills or ability to do so. Ira Glass describes this as the “taste gap” – the difference between what we would desire to produce at our taste level, and our ability. In this short video (different version below) he talks about the importance of practicing and continual creation in our field of choice to help decrease the gap. Only through repeated effort can we improve our skills to work towards creating work that meets our taste level. This process can be challenging so we need to continue to encourage our children and students to practice and explore and continue creating so that they can improve their skills. Hanging Out, Messing Around and Geeking Out: We came back to the value of play many times. Mimi Ito at MIT is doing some interesting work with teens and digital media, one research report we recommend is called Hanging Out, Messing Around and Geeking Out. She has lots of other great work, and this one identifies the different types of activities that teens do when they’re “playing” on the computer. This is a great start to understanding the value of play and spending time online. iPad Trial in Grade 7: At the very end of our session, we talked a bit about how different devices can allow us to express creativity in different ways, which connects nicely with our upcoming iPad Trial in Grade 7. If you’re not a Grade 6 or Grade 7 parent, and haven’t heard about the trial yet, you may want to take a look at this recap of the parent session we hosted on March 4th. We’ll be continuing to share more details about the trial as it moves forward, starting with parents and students who are involved in the trial and then sharing more with the wider school community. 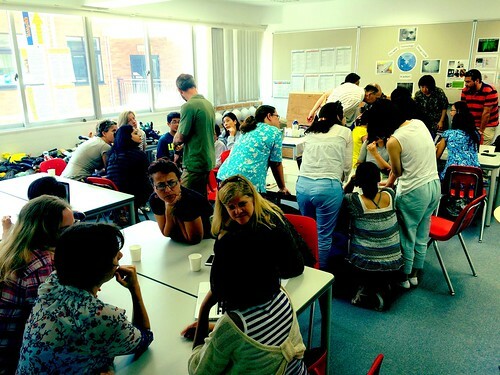 Our next Parent Tech Coffee Morning will be Wednesday, 14 May from 9:15 – 10:15 in M101 on the theme of connectedness. This session will highlight some of the ways that students (and teachers) stay connected and why those connections are so important. From Twitter to Instagram to Facebook, many people in our community are sharing, collaborating and communicating in a variety of contexts. Come to this session to find out why! We had a great turnout at today’s Parent Tech Coffee Morning! Thank you to everyone that joined us, and for those that were unable to make it, we hope to see you next time! the way that teens and adults view their privacy online – surprisingly it is very similar! the process of hiring and recruitment for employment. Often employers will start with a Google search on prospective employees. One of our parents made a great point that although it’s important that those search results are not entirely negative (that can easily get your application thrown off the table), it’s equally important that you have some kind of online presence. This shows that, as an applicant, you understand the ways that we communicate today. A balanced profiles shows an understanding of these tools, and a genuine person that does have a personal life as well as professional qualifications. the challenges of being social in a face-to-face environment and how that translates to online environments. Just because we are not taking photos and posting them, doesn’t mean that others are not taking photos of us and posting those. This may lead to a difficult conversation with friends when you have to ask them to take the photo down. understanding that our individual privacy settings do not affect the settings of our friends. So, if a friend takes a picture of me and posts it on their wall, it can be public, even though my personal settings might be private. 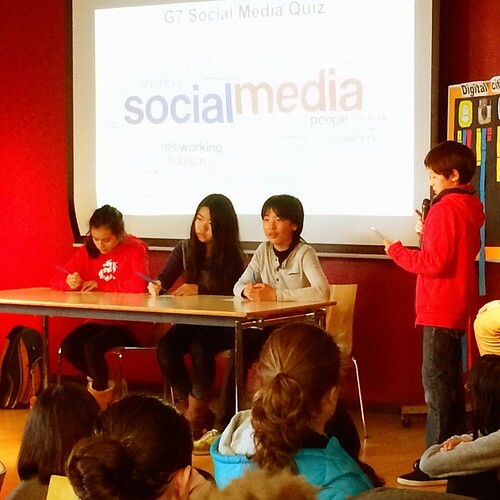 Our Digital Dragons site – this is where everything related to digital citizenship at YIS is hosted. Our 2-day orientation schedule – this is how we start each school year. Our Digital Citizenship Week in February – this is a special week to highlight some of the themes that we address in our curriculum, as well as to bring attention back to the importance of maintaining balance in our lives. Our Digital Citizenship curriculum – this is a series of lessons taught in Middle School Humanities. One of the most challenging aspects of the constant access and availability of information is that our children can find and explore images and media that is well beyond their developmental readiness level, particularly explicit imagery. Although this kind of material is filtered out on our school network, this may not be the case at home, or at a friend’s house, or the local coffee shop, or through 4G access. Understanding the impact of what children can see, how we might best talk to our children about these experiences, and how they may impact future relationships are all areas for discussion. We may not have easy answers for you, but we can certainly share the current developments in education and strategize together. Our next session will be Wednesday, 15 January from 9:15 – 10:15 in M101. We hope you can join us!